The Women in Public Service Project was launched in 2011 by then U.S. Secretary of State Hillary Clinton in partnership with Barnard, Bryn Mawr, Mount Holyoke, Smith and Wellesley colleges. 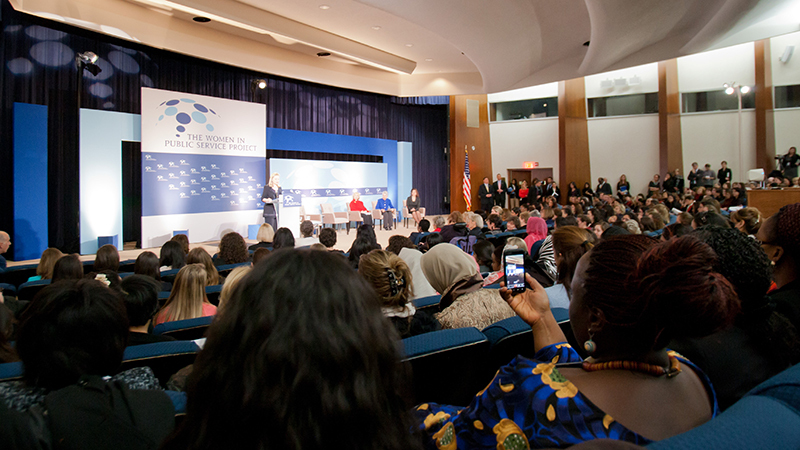 A partnership of the U.S. Department of State and the Seven Sisters colleges, the Women in Public Service Project (WPSP) is a program of the Global Women’s Leadership Initiative at the Wilson Center. Its mission is to empower the next generation of women around the world to enter public service. Current WPSP partners and sponsors include the U.S. Department of State; Smith, Bryn Mawr, Mount Holyoke, Wellesley and Simmons colleges; and Mount Saint Mary’s University Los Angeles. Among the board of directors are Smith College President Kathleen McCartney and Smith alumnae Jane Harman ’66, president and CEO of the Wilson Center, and Farah Pandith ’90. Since its launch in 2011 by then U.S. Secretary of State Hillary Clinton, WPSP has grown to include more than 80 academic institutions and government entities around the world. Today, women make up 49.7 percent of the world’s population but hold only 22 percent of public offices. WPSP is committed to helping women reach a minimum of 50 percent of all decision-making positions in public service by 2050 ("50x 50"). The Leadership Index shows us where women are in governments around the world, how much power they hold and how they got to their positions of leadership. Congratulations to Marie Wilken '18, a government major at Smith, for being selected as one of the winners of the WPSP Student Research Competition. She presented her paper "Make America 41st Again: Factors That Slowed America's Relative Growth in Women’s Representation" at the Wilson Center in Washington, DC, on April 13, 2017. WPSP is advancing progress toward women’s equal participation in policy and political leadership through innovative research, dynamic learning institutes, mentoring and training. To learn more, visit WPSP’s Programs & Events page. Smith, Mount Holyoke and Simmons colleges hosted a two-week Institute, “Reconstructing Societies in the Wake of Conflict: Transitional Justice and Economic Development,” in 2014. This Institute explored the crucial issues of human and economic security in rapidly changing societies with an emphasis on Asia. “Women’s Leadership: Public Service and Global Health” was held in Paris on October 17–21, 2012, and was organized by Smith College and co-sponsored by Smith and the U.S. State Department. The conference centered on the broad topic of public service leadership on issues of public health.